In 20 days, I plan to have my 1979 Jeep Cherokee Golden Eagle ready for the Toledo Jeep Fest—a gathering of Willys, Kaiser, AMC, DaimlerChrysler, Chrysler and Fiat Chrysler-era off-road machines in the hometown of Jeep itself. But things aren’t looking good, and what’s not helping me is the fact that my Jeep has the bigger engine: the V8. What I’m about to say is pretty much blasphemy in the car enthusiast world, but I’m going to say it anyway: I wish my Jeep had the six-cylinder engine, and not the V8. 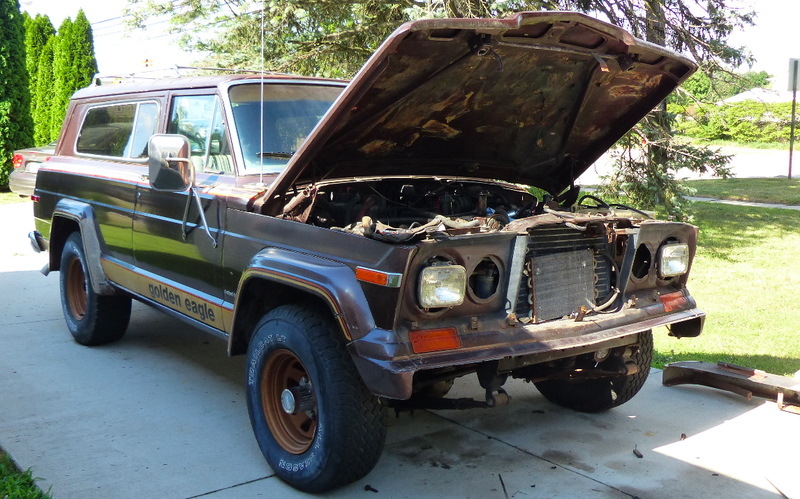 If I’ve learned anything working on my 1986 Jeep Grand Wagoneer and especially now as I try removing a cylinder head to extract a broken exhaust stud from my 1979 Cherokee, it’s that if you’re going to wrench on a vehicle, getting the big motor may not always be the best choice. Especially if that vehicle is going to be a light-duty daily driver. The engine bay of my V8 full-size Jeep is damn tight, despite the relatively large engine bay size. That wide V8, and its gigantic front-end accessory drive, makes reaching my hands to remove spark plugs or take off the exhaust manifolds a real chore. And that giant intake manifold in the V is just covered in all sorts of junk, all of which I’ll have to undo in order to get the head off (I’ll be removing both while I’m in there). It’ll take forever! By contrast, here’s my Jeep J10's 258 inline-six, which, sure, isn’t quite as powerful, but if we’re honest, the AMC 360 V8 isn’t going to scorch tires, either. The exhaust manifold has tons of space to move out of the way, and removing the intake manifold—which is relatively uncluttered—is a breeze. It’s something that not a lot of my friends really consider when purchasing trucks. “Dude, get the 5.0-liter V8, of course!” they say when looking at Ford trucks. I myself? I’d be half inclined to snag the less powerful, smaller and, arguably, more reliable 300 inline-six. It’s the same thing with my full-size Jeep friends. For them, it’s V8 or bust, with the 401 V8 being the holy grail. I’ll take the easily-serviceable, unkillable AMC inline-six. At this point, I’ve realized that any joy those additional 50 horsepower (or however many—honestly, I have no clue what an AMC 360 really makes) bring me over the AMC 258's inline six’s output is all outweighed by the additional time and stress needed to maintain the V8. Serviceability; it matters. Sometimes even more than horsepower. What Do You Wish You&apos;d Known About Your Car Before Buying It?